Life expectancy has increased dramatically over the last century. In fact, the World Health Organization now estimates that people over the age of 65 will outnumber children under the age of 14 by 2050. This shift in age demographics raises significant health and quality-of-life challenges for both aging parents and their children. But scientific advances such as smart-home technology for the elderly, often referred to as assistive domotics, are supporting the ability to age in place and extending independent years for those who wish to remain in their homes for as long as possible. What is aging in place? Simply put, aging in place is a person’s ability to live in his or her own home as he or she grows older. A person may age in place independently or may require the assistance of caregivers, assistive domotics or other support services. Assistive domotics refers to smart-home systems like Constellation Connect, which can be used to improve home safety for the elderly or to assist with aging parent care by monitoring their homes and keeping them safe and protected. Assistive domotics can also be used to help with daily tasks that seniors might have difficulty completing on their own. These same solutions can also be used to help disabled people lead independent lives. Remotely control your home and save energy with appliance-monitoring systems. Taking care of elderly parents who live on their own can be nerve-racking if the parent lives with dementia or Alzheimer’s disease. Seniors living with these conditions may neglect to turn off lights, may leave faucets running or—most alarmingly—leave stove tops or ovens on. Smart-technology can help detect abnormal appliance use. Appliance-monitoring systems send alerts to seniors and their caregivers when unusual activity is detected, allowing for a quick response. Many such systems offer the ability to turn off appliances remotely, making aging parent care easier and safer. Decrease energy use and adjust room temperature with a smart thermostat. With many seniors living on fixed incomes, reducing energy costs is an important aspect of aging in place. Smart thermostats control the home environment, heating and cooling the home automatically so that you don’t have to worry about someone forgetting to set the thermostat. Assistive domotics can detect when the house is unoccupied, reducing heating or cooling to save energy until the resident returns home. Make quick and easy calls from anywhere in the house with smart assistants. Home automation for the elderly and disabled often utilizes smart assistants capable of making phone calls and functioning as in-house intercoms. If you’re taking care of elderly parents, this allows them to contact you quickly without having to locate a phone—an important consideration if your loved one falls or needs medical attention. Smart assistants also help access entertainment. Simple voice commands are all you need to play music or videos or read e-books. For someone with limited mobility, such features make independent living easier and more enjoyable. Track your health with smart health-monitoring systems—and send results automatically. Taking care of elderly parents sometimes means being in the know about serious health conditions such as heart disease, stroke, cancer or diabetes. Wearable biomedical sensors monitor blood pressure, blood sugar, heart rate and other vital signs, allowing both seniors and caregivers to respond to medical emergencies quickly while avoiding the costs associated with in-patient care. Make grocery shopping a breeze with smart assistants or smart refrigerators. A loss of mobility can make even a grocery trip problematic. Assistive domotics can help with this necessary chore. Smart refrigerators monitor how much food is left in the fridge, pushing notifications to the homeowner or caregiver when groceries need to be restocked. Smart assistants can also be programmed to order items at set times from online or local delivery services so that groceries are delivered directly to the home. Get automatic reminders to take essential medications and never miss a pill or dose. Ensuring that medication is taken on time and in the right amounts is one of the challenges of aging parent care, as a parent may forget whether they took important medication. A smart-assistant routine can remind seniors when they need to take medication or let them know whether they already took those meds. Smart pillboxes—which link to other smart devices—also help maintain safe and regular medication routines. Install automated doors and cabinets to improve accessibility around the house. If mobility is an issue, automated doors and cabinets can make it easier for the elderly to navigate their homes, especially when combined with safety handrails, walk-in bathtubs and other mobility devices. Robot vacuums reduce the effort seniors need to keep their houses in order while keeping rooms free of debris that could be a tripping hazard. Set up window, cabinet, door or flood sensors to monitor your home. Seniors who age in place make attractive targets for criminal activity, but smart technology can enhance home safety. Smart-home systems like Constellation Connect link to sensors capable of detecting suspicious activity such as breaking windows, motion within the house, or the opening of doors or cabinets. Other sensors detect less sinister but potentially damaging activity—including plumbing leaks and flooding. In all cases, push notifications are sent to any linked smart devices, alerting you to possible home damage or safety issues. Install automatic lights to keep loved ones safe and save energy. A bad fall can cause serious injury and even bring a loved one’s days of independent living to a sudden halt. Smart motion sensors reduce the risk of falls by turning on lights when movement is detected. The same sensors can also alert you to unusual activity inside and outside the house at night, improving home safety for the elderly. As a bonus, automatic lights help you save energy by turning off lights in unoccupied rooms. Pro tip: for more information on motion detectors, check out Constellation’s article on dimmers and energy-saving light switches. Access personal emergency response systems from anywhere in your home. The possibility that a loved one could be in danger or in need of emergency medical treatment while you’re not with them is a scary scenario for anyone considering aging parent care. A personal emergency response system (PERS) is a portable emergency button for seniors. Activated literally at the push of a button, a PERS can be linked to a user’s smartphone or to smart assistants. If linked to a smart assistant, a PERS can be voice activated from anywhere in the home. Prevent accidental wandering and keep loved ones safe with elderly monitoring systems. When suffering from Alzheimer’s or dementia, an emergency button for seniors may not be sufficient to keep him or her safe. People living with dementia are prone to wandering from their homes. Once out in the world, they may become lost and confused. Geofencing can help you keep track of a person with dementia by setting up designated safe zones through GPS. Should the person wander out of these safe zones, caregivers are notified through smartphone apps, which then help track your loved one. Prevent outdoor injury and keep your lawn trim with a robotic lawn mower. Your loved one can overexert themselves, fall or otherwise be injured performing yard work. While an emergency button for seniors will alert you to such problems, avoiding injuries in the first place is always preferable! Similar to robot vacuum cleaners for inside the house, robot lawn mowers can keep the lawn trimmed, freeing homeowners from this time-consuming and exhausting outdoor chore. Pro tip: interested in more ways to extend technology into your backyard? Check out Constellation’s compilation of outdoor home automation ideas. Install a video doorbell to see who is at the door without having to stand up. Video doorbells allow seniors to see who’s at their door without opening it. The doorbell sends streaming video to their smartphones, allowing them to not only identify the person at the door but also speak to the visitor from a position of safety. As a security device, a video doorbell has obvious benefits. But virtual doorbells also make life easier for those with hearing problems: they can send notifications to smartphones when packages are delivered to the door. Secure your home with easy-to-use smart locks. Smart locks offer a number of advantages for those aging in place. By using an app on your smartphone, you can lock and unlock doors remotely or set times at which doors lock automatically. The app can grant specific people access to the house—such as caregivers—and there is no need to use a physical key. Keep an eye on your house with smart security cameras. Depending on the system, home automation for the elderly and disabled can include smart security cameras, which monitor the home for intruders and send notifications to smartphones if suspicious activity is detected. 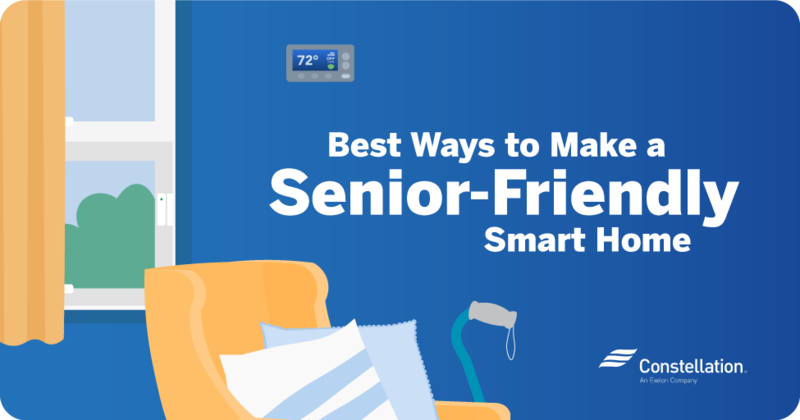 The benefits of home security cameras also make taking care of an aging parent easier—you can use the smartphone-enabled app to check in on parents and make sure they don’t require assistance. Pro tip: installing a smart security system with home automation built-in like Constellation Connect can protect your home from intruders anytime, anywhere. Get 24/7 protection, monitoring, and home connectivity to devices in your smart home for seniors. Implementing smart homes for elderly and disabled family members can make aging in place safer and more enjoyable. A sense of independence helps maintain a high quality of life, and children of elderly parents appreciate how quickly smart-home systems alert them to their parents’ needs. A little technology can make at-home independence possible for longer—and can help your loved ones thrive for years to come. A very informative article on the safety of elderly living. I run a similar blog. Thanks. Hi Sharad, thanks! Glad to help.